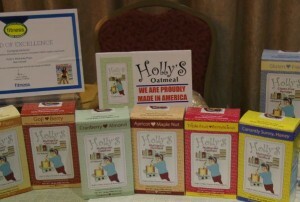 The Stop&Shop Local Vendor Show took place last week (9/15/2011) at The Lantana in Randolph, MA. It was organized by Ahold USA Supplier Diversity & Trade Relations office to give small New England grocery manufacturers an opportunity to interact with the Stop&Shop buyers. A little less than one hundred local grocery manufacturers gathered to showcase products in categories such as dairy, baked goods, condiments, sauces, meats, frozen products, pet food, and many more. Each vendor set up products, displays, POS materials, sell sheets, etc. on a table at the large banquet hall. Almost all the vendors offered samples and tasting opportunities, although sadly mostly to other vendors. The show was designed so that every vendor got to spend a few minutes with one or more Stop&Shop buyers. For the most part these buyers are the final arbitrators when it comes to the decision about products finding their way into the stores. There were also Stop & Shop associates on the floor, probably to help and recommend the buyers with their initial evaluation of the products. While this was a great opportunity for small manufacturers is was a much better opportunity for the buyers to see everything local suppliers have to offer in a trade show settings. We just hope that many good connections were made and that some of you will make it into the stores. Please share your thoughts and ideas about this event and tell us if this was a good overall experience. The organizers of the show will most likely read what you have to say. This was a great event for us. It was well organized, a fine venue, providing a good opportunity for networking. This was most helpful to me and my company. I agree with those comments that there was a a lot of time when we were not meeting with teams and interested buyers. Some type of scheduling of meetings would be most helpful. However I really applaud Stop & Shop for giving us this opportunity. The company is to be commended. James Sturgis was a real trooper and did an excellent job in communicating with us. This was a fantastic opportunity for new vendors and Stop&Shop buyers to meet! I very much appreciate being invited to showcase our delicious product, Ola! Granola so that the buyers could sample and become familiar with our brand. Looking forward to next steps! Many thanks to Stop & Shop for hosting a local vendor fair. From a vendor's perspective, not only did we meet up with buyers from Stop & Shop, but we also met many other local vendors. The buyer we met with was not the best fit for our company and product line, but she was nice enough to have us meet up with the buyer was better suited for our needs. Overall, it was a very valuable experience. Overall, I feel the event was successful in achieving Stop and Shop's goal, which was to meet local producers to potentially bring into their stores. The approach might have been a bit different in that it could have been more by appointment so we didn't have to hang around all day long waiting for our meetings. It started off feeling like a trade show and ended up being a wait show. I did make some great business contacts for my pasta business. I thought the Stop& Shop Local Vendor Fair was wonderful and that James Sturgis was a warm host who actually got back to me beforehand when I had questions. Not only did I speak with Stop&Shop buyers, I met and spoke with representatives from UNFI, a pretty potent combination I would say. Some of us are not as learned as others as we enter the daunting maze of big time food, but I learned a ton from all the other vendors who were happy to share their experiences with me. I think I made a lot of new friends , too. We were very happy to be able to present to Stop N Shop in such a manner. This is the first trade show of this kind that we have heard of. While I believe it could have been shortened by several hours in having the correct buyers have scheduled times with the correct vendors I did feel that it was extremely well organized and we were well informed on what we should expect from the event. I also found it very helpful that they sent us an information packet on what we information we should readily be able to provide the buyers when they did come by the table since it was going to be for a short amount of time. It's great that Stop & Shop is committed to local vendors, and it's Glee-ful to see such diversity in New England! Thanks for this iniative! Hi! Thank you for the opportunity to present at Randolph. While this was an interesting experience, we feel that the organization was more apropo to a matchmaker event and not a tradeshow event. Vendors were there for many hours, in most cases for a total of 10 minutes with a couple of the teams. There was no opportunity to actually get orders with a 'tradeshow discount'. A matchmaker event would have accomplished the same thing without making so many vendors spend an entire day at the show. Also, the pre-organization was not very efficient. There was no real information on how, where & what prior to the event as there is for a true tradeshow.